Craig Gilroy burst onto the scene for Ulster in November 2010 when he scored two tries against Cardiff Blues on his debut. The winger continued his steady rise and in January 2012 was invited to train with Ireland squad for the Six Nations. 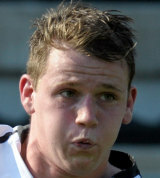 His form in that season earned him a full-time contract with Ulster after he had scored eight tries in 14 appearances. At the end of the season he was voted Ulster Young Player of the Year and was rewarded by starting the match against the Barbarians in May 2012 in which he scored two tries. Craig represented Ireland Schools' and was also part of the Ireland U20 side that competed in the 2011 Junior World Championships. His early-season form in 2012/13 then earned him a call-up to the Ireland squad for the autumn internationals. After winning his first cap against Argentina, he went on to impress during Ireland's disappointing Six Nations campaign.